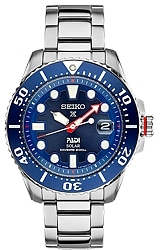 This Prospex Seiko SOLAR POWERED Dive Watch is a special edition for Seiko's newly formed association with the Professional Association of Diving Instructors or PADI. 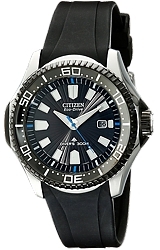 One of the best looking dive watches on the market, this watch has a 44mm stainless steel case with a hardlex crystal and a stunning blue dial. .This model features a 10 month power reserve when fully charged (with light). A popular feature is the highly luminous hands and markers treated with Lumibrite paint for exceptional low light visibility. PLEASE NOTE: As an AUTHORIZED SEIKO USA DEALER we can not ship this watch to the EEA (European Economic Area).